US natural gas production increased by 42% between 2005 and 2014, largely due to recent advances in horizontal drilling and high volume hydraulic fracturing. One of the largest natural gas reservoirs in the US, the Marcellus Shale, underlies much of the state of Pennsylvania, and there is concern that chemicals used in association with gas extraction will end up in local drinking water supplies. Our study showed that organic chemicals detected in groundwater wells were derived from surface releases (i.e., spills at the ground surface) from hydraulic fracturing operations, rather than transport from deep shale formations. This analysis provides more clarity on potential issues related to hydraulic fracturing and can help communities and industry better address potential water contamination events. To get natural gas from underground shale formations, drillers inject large volumes of water, sand, and some chemicals into wells, which fractures the rock and releases the trapped gas. 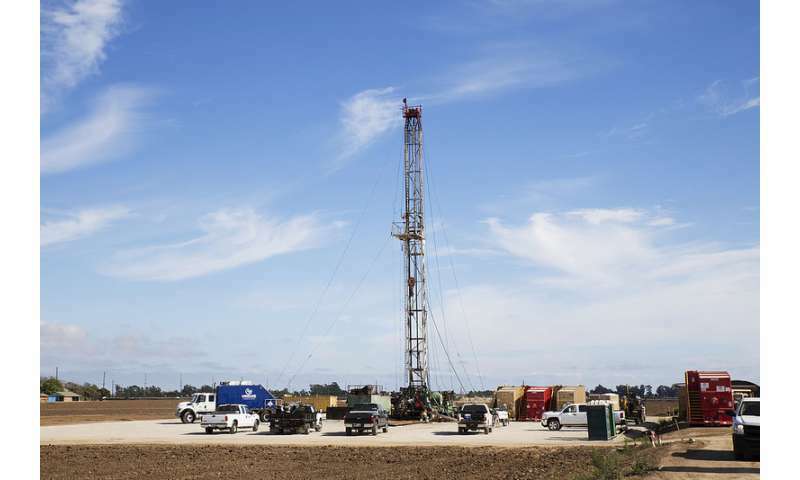 Earlier this year, the US Environmental Protection Agency (US EPA) issued a long-awaited assessment of hydraulic fracturing and directly noted "there is insufficient pre- and post-hydraulic fracturing data on the quality of drinking water resources." Our study helps to address this issue by collecting complimentary geochemical data over a wide geographic area. Nearly 1,000 organic chemicals are disclosed as additives in hydraulic fracturing, but it is unclear if they enter drinking water supplies. There are a number of potential migration pathways to groundwater aquifers, including: faulty gas well casings, leaking waste containment ponds, underground fuel storage tanks, migration from deep shale (formations approximately 1 mile deep), and surface releases associated with hydraulic fracturing activities. We determined that the likely exposure pathway was from surface operations at gas well sites and not from deep subsurface transport. These findings are encouraging, because disclosed spills of chemicals at the surface can be targeted for rapid clean up, and homes in the area can employ point-of-use water treatment technologies when needed. In other words, surface releases are much easier to treat and control than subsurface processes. Also, the types of organic chemicals detected in this study are readily treated by in-home water filtration systems that employ charcoal or activated carbon. Since domestic fossil fuel production often necessitates the colocation of industrial operations with residential areas, there is an inherent environmental and public health risk associated with accidents, just as with any engineering practice. Shale gas exploration has increased the area in the US subjected to this type of risk, and efforts to minimize human and machine error will minimize the impacts on local residences. Further, better accident reporting and environmental monitoring can help local municipalities ensure the safety of their drinking water in cooperation with gas extraction experts. In this study, we focused on over 50 compounds organic compounds associated with hydraulic fracturing to address a gap in research on this topic. Levels of diesel range organic compounds (hydrophobic chemicals with boiling points similar to diesel fuel) in the groundwater samples were dilute (less than 200 parts per billion). However, they were statistically correlated with distance to the nearest active shale gas well in the region and were significantly higher within a one kilometer radius of a gas well. These results are similar to studies of hydrocarbon gases (e.g., methane, ethane, and propane) in the same region. In particular, active shale gas wells that have had a documented environmental health and safety violation were spatially correlated with groundwater that contained higher levels of diesel range organic compounds. Furthermore, a known hydraulic fracturing fluid additive, bis(2-ethylhexyl) phthalate, was detected in a subset of samples. This chemical is used in many industrial materials and practices, but it was not detected in a wide range of samples or representative natural water (i.e., a natural spring in the study area). A common question regarding the environmental and public health consequences of natural gas extraction via hydraulic fracturing is whether or not fluids can travel from shale horizons to drinking water aquifers through geologic faults and fissures. 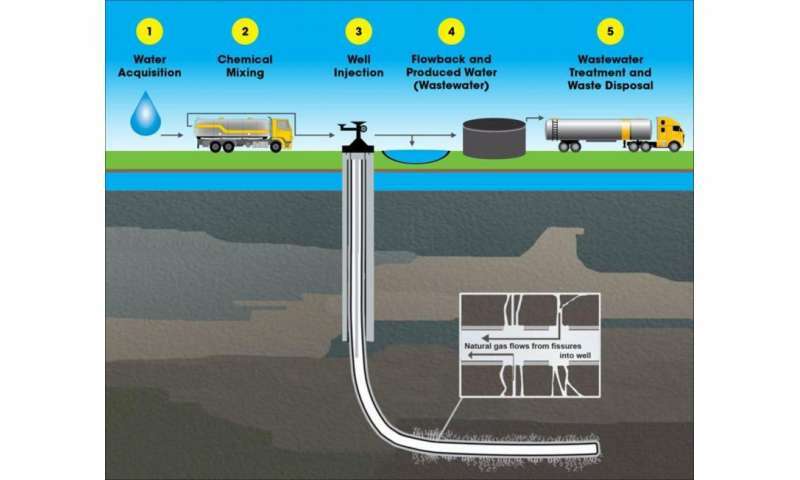 That is, can hydraulic fracturing fluids migrate upward through cracks to contaminate sources of drinking water? Proposed upward migration scenarios could introduce the nearly 1000 disclosed organic industrial chemicals used during the fracturing process to shallow groundwater. To date, this remains unproven and undocumented. The detected organic compounds in the sampled groundwater in our study were not the result of migration of fracturing fluids from the shale horizon to drinking water aquifers. This was demonstrated using a series of complimentary analyses. For example, fluids migrating from deep shale horizons should contain high amounts of unique noble gases and salts, but the groundwater samples that contained higher diesel range organic compounds did not contain these other chemical markers. In contrast, the chemical character of the groundwater showed the water was in relatively recent contact with the surface of the Earth and was not related to the salt content. Our study focused solely on a region of developed Marcellus Shale in northeastern Pennsylvania, and it is important to note that the results of this study may not translate across all shale formations within the US. Spatial and temporal separations of hydraulically fractured shale horizons can vary widely due to local geology. Similarly, vertical distances between aquifers and shale formations, as well as the historical oil and gas development in the region, can affect the transport times of deep subsurface fluids to shallow groundwaters. Therefore, continuous monitoring will provide a better understanding of potential risks that may arise over time and space. Considering that domestic fuel production is growing, it would be helpful to compare the rates of spills associated with natural gas production with spills from other chemical or fuel industries. In ocean transport of oil, only 0.00007% of the volume is released on average (including large spill years). Since gas extraction violation reports do not include volumes, it is not currently possible to answer the question: are surface releases associated with hydraulic fracturing any worse than other fuel technologies on which we rely? Having the volume information will help improve the industrial practices and safety of the growing natural gas industry.